For his father, see Christopher Van Hollen (diplomat). In this Dutch name, the family name is Van Hollen, not Hollen. Christopher J. Van Hollen Jr.   (born January 10, 1959) is an American politician serving as the junior United States Senator from Maryland since January 3, 2017. From 2003 to 2017, he held the position of U.S. Representative for Maryland's 8th congressional district. He is a member of the Democratic Party. Van Hollen speaking during the second day of the 2008 Democratic National Convention in Denver, Colorado, in his capacity as chairman of the Democratic Congressional Campaign Committee. He is flanked by Democratic House challengers. In 2006, Van Hollen opted out of the race to succeed the retiring Senator Paul Sarbanes, saying he would rather spend time with his family and help elect more Democrats to Congress. In keeping with that, Van Hollen was appointed to Chairman of the Democratic Congressional Campaign Committee. Prior to Van Hollen's election, incumbent Connie Morella had won eight elections in the district, despite the fact that she was a Republican in a district that had swung heavily Democratic. Morella's success was largely attributed to her political independence and relatively liberal voting record, including support for abortion rights, gay rights, gun control and increased environmental protections. After Morella's reelection in 2000, Democratic Maryland Senate President Thomas V. Miller, Jr. made no secret that he wanted to draw the 8th out from under Morella. Indeed, one redistricting plan after the 2000 U.S. Census went so far as to divide the 8th in two, giving one district to Van Hollen and forcing Morella to run against popular State Delegate Mark Kennedy Shriver in November. The final plan was far less ambitious, but made the district even more Democratic than its predecessor. It absorbed nine heavily Democratic precincts from neighboring Prince George's County, an area that Morella had never represented. It also restored a heavily Democratic spur in eastern Montgomery County that had been cut out in the last round of redistricting. In 2002, Van Hollen entered a competitive Democratic primary against Shriver and former Clinton Administration aide Ira Shapiro. Though Shriver had the most money, Van Hollen launched a very successful grassroots effort that mobilized Democratic voters. After receiving the endorsement of The Washington Post, The Baltimore Sun, and other local papers, Van Hollen defeated Shriver 43.5 percent to 40.6 percent. During the campaign, Van Hollen emphasized that even when Morella voted with the district, her partisan affiliation kept Tom DeLay and the rest of her party's more conservative leadership in power. Van Hollen also touted his leadership in the State Senate on issues such as education funding, HMO reform, trigger locks for handguns, and protecting the Chesapeake Bay from oil drilling. Ultimately, after a tight race, Van Hollen defeated Morella 51.7 percent to 48.2 percent. Van Hollen crushed Morella in the Prince George's County portion of the district, while narrowly winning Montgomery County. However, Morella won most of the precincts she'd previously represented. Proving just how Democratic this district was, Van Hollen was reelected four times from this district by over 70 percent of the vote. However, it had long been taken for granted that the Republicans would face extremely long odds of retaking the seat if Morella retired or was defeated in an election. After the 2010 census, Van Hollen's district was made slightly less Democratic. He lost a heavily Democratic spur of Montgomery County to the neighboring 6th district, and lost his share of Prince George's County to the 4th district. In their place, the 8th absorbed heavily Republican Carroll County and a strongly Republican spur of Frederick County. Nonetheless, since his share of Montgomery County has more than double the population of his shares of Carroll and Frederick counties combined, Van Hollen easily won a sixth term over Republican Ken Timmerman with 63 percent of the vote. While Van Hollen lost in Carroll and Frederick, he swamped Timmerman in Montgomery by 113,500 votes. ^ "Pelosi Names Conferees to FY 2014 Budget Conference". www.democraticleader.gov. Archived from the original on July 4, 2014. Retrieved July 4, 2014. ^ a b Robillard, Kevin; Schor, Elena. "Van Hollen to serve as DSCC chair". Politico. Retrieved November 18, 2016. ^ "Christopher Van Hollen, Jr". Ancestry.com. Retrieved August 31, 2012. ^ "State Department Policy Analyst Eliza Van Hollen". The Washington Post. February 26, 2007. Retrieved August 31, 2012. ^ Kelly, Jacques (February 3, 2013). "Christopher Van Hollen Sr., ambassador, Former Baltimorean and father of Md. congressman was ambassador to Sri Lanka and career Foreign Service officer". Baltimore Sun. Retrieved February 25, 2013. ^ "State Department Policy Analyst Eliza Van Hollen". Washington Post. February 26, 2007. Retrieved February 25, 2013. ^ a b c d Matusow, Barbara (June 1, 2008). "Can Nice Guy Chris Van Hollen Finish First?". Washingtonian. ^ "State Department Policy Analyst Eliza Van Hollen". The Washington Post. February 26, 2007. ^ "Chris Van Hollen (D)". Wall Street Journal. Retrieved June 14, 2015. ^ a b c d "VAN HOLLEN profile". Biographical Directory of the United States Congress. ^ a b "Chris Van Hollen, Jr. Biography". Maryland State Archives. ^ "Christopher Van Hollen, Jr". Maryland Manual Online. ^ "Commencement Speaker". University Communications Newsdesk, University of Maryland. December 2, 2004. Retrieved August 31, 2012. ^ a b "American Political Science Association election review" (PDF). Retrieved August 31, 2012. ^ Bosland, Julie. "CEF Honors members of Congress for education funding". Questia Online Library. Retrieved August 31, 2012. ^ Mosquera, Mary (September 10, 2003). "House votes against revised A-76 rules". GCN. Archived from the original on September 30, 2007. Retrieved August 31, 2012. ^ "Transcript of Congress speech on national security". House.gov. September 19, 2006. Retrieved August 31, 2012. ^ a b Fingerhut, Eric (December 31, 2008). "Van Hollen strongly backs Israel". Jewish Telegraphic Agency. Retrieved July 13, 2017. ^ Baker, Jesse; Rabinovits, Jeremy (August 15, 2006). "Hard Choices and Right Choices in the Mideast". Washington Post. Retrieved July 13, 2017. ^ Craig, Tim; Wagner, John (July 12, 2005). "Van Hollen says he won't run for Senate". The Washington Post. Retrieved August 31, 2012. ^ Coalition for Green Bank applauds US Congressman Chris Van Hollen's Green Bank Act Archived 2009-03-27 at the Wayback Machine, newenergyworldnetwork.com, March 25, 2009. ^ "House Democrats Introduce the Green Bank Act of 2014". vanhollen.house.gov. Archived from the original on June 28, 2014. Retrieved July 4, 2014. ^ Kane, Paul (March 5, 2010). "Michigan's Sander Levin replaces Rangel as House Ways and Means chairman". The Washington Post. ^ "Van Hollen, House Democrats Introduce DISCLOSE 2012 Act". vanhollen.house.gov. Archived from the original on July 4, 2014. Retrieved July 4, 2014. ^ "Top Democrat sues Federal Election Commission over anonymous donors". The Hill. April 21, 2011. Retrieved August 31, 2012. ^ "U.S. Congressional International Conservation Caucus Members". International Conservation Caucus. Retrieved August 31, 2012. ^ "The Humane Society Legislative Fund – Project Vote Smart". Archived from the original on December 4, 2011. Retrieved November 21, 2012. 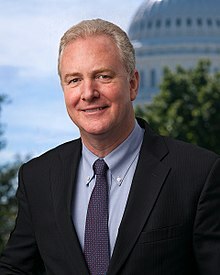 ^ "An Economy that Works for Everyone | Chris Van Hollen". Retrieved August 20, 2016. ^ "Brady Campaign to Prevent Gun Violence – Project Vote Smart". Retrieved November 21, 2012. ^ "Brady Campaign to Prevent Gun Violence". Retrieved November 21, 2012. ^ "Key Votes – Chris Van Hollen, Jr. – Project Vote Smart". Retrieved November 21, 2012. ^ Fritze, John. "Van Hollen crafts gun licensing bill". baltimoresun.com. Retrieved October 4, 2017. ^ Siegel, Robert. "Democrat Senators Introduce Bill To Ban Bump Stocks After Las Vegas Massacre". National Public Radio. Retrieved October 4, 2017. ^ "Van Hollen: 63rd Attempt to Dismantle Obamacare a 'Historically Callous Action'" (Press release). Chris Van Hollen. February 2, 2016. Archived from the original on December 10, 2016. Retrieved December 5, 2016. ^ "Rep. Chris Van Hollen: key health care votes". healthreformvotes.org. healthinsurance.org. Retrieved December 5, 2016. ^ Howell, Tom Jr (February 2, 2016). "Democrats foil GOP repeal of Obamacare". The Washington Times. Retrieved December 5, 2016. ^ "Chris Van Hollen on Health Care". ontheissues.org. On The Issues. Retrieved December 5, 2016. ^ "The Voter's Self Defense System". Vote Smart. Retrieved March 21, 2019. ^ Thomsen, Jacqueline. "Bipartisan bill would block foreign adversaries from owning US election vendors". The Hill. Retrieved October 11, 2018. ^ Fleischer, Jodie; Leslie, Katie; Piper, Jeff. "Measure Seeks to Prevent Foreign Ownership of US Elections Firms After Russian Invests in Maryland Elections Vendor". NBC Washington. Retrieved October 12, 2018. ^ "Citizens Against Government Waste Homepage". Retrieved November 21, 2012. ^ "National Taxpayers Union". Retrieved November 21, 2012. ^ "CTJ – Citizens For Tax Justice". Retrieved November 20, 2011. ^ "Political Courage Test – Project Vote Smart". Retrieved November 21, 2012. ^ "Election 2010: Maryland" - Major party results, The New York Times. Retrieved December 3, 2016. ^ "Maryland 8th Congressional District Results", Politico.com. April 18, 2016. Retrieved December 3, 2016. ^ "2014 Maryland House Election Results". Politico.com. November 15, 2014. Retrieved December 3, 2014. ^ "Official 2016 Presidential Primary Election results for U.S. Senator". Maryland Board of Elections. May 31, 2016. Retrieved December 3, 2016. ^ "Unofficial 2016 Presidential General Election results for U.S. Senator". Maryland Board of Elections. December 1, 2016. Retrieved December 3, 2016. ^ "About Chris". Office of Senator Chris Van Hollen. Archived from the original on August 20, 2017. Retrieved August 19, 2017.